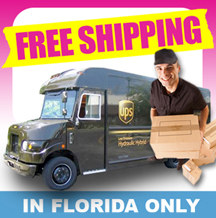 FREE shipping anywhere in Florida. Having your orders shipped FREE in Florida will not effect turnaround time. So whether you pick them up at our facility, or have them shipped/delivered for FREE to you the turnaround time is the same. Order on Wednesday before 8pm and your order will be at your door Friday.